stranger to pray for this area of your life?! This student isn’t alone… Read more in the newsletter below. 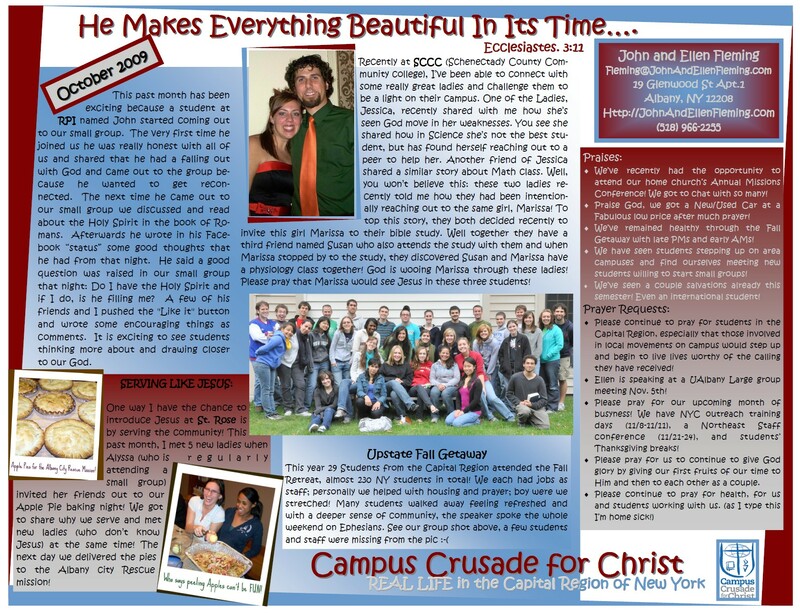 Would you make a gift of $50, $200 or $500 to help us contine to reach college students for Christ? To give online just click below the button below. All gifts made before December 31 at midnight are tax-deductible for the 2011 year. Thank you again, and we wish you a very safe and Happy New Year! It has been a little while since our last update. So much has happened! We hope you enjoy our update on the exciting conference and service project we went to last month in Panama City Beach, Florida. What a faith building experience! 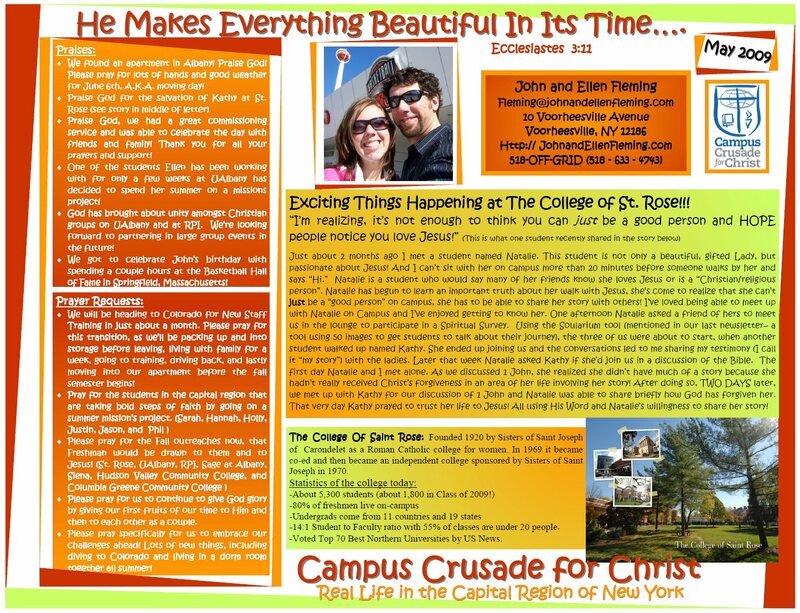 Recent news not in our newsletter include a student at Hudson Valley Community College and another at the College of St. Rose where we were blessed to personally introduce students to Christ for the first time! Please pray for Mark* and Steve*, that they would plug into fellowship on campus and grow tremendously in their newfound faith in Christ! We will be sending out an April update soon as well! 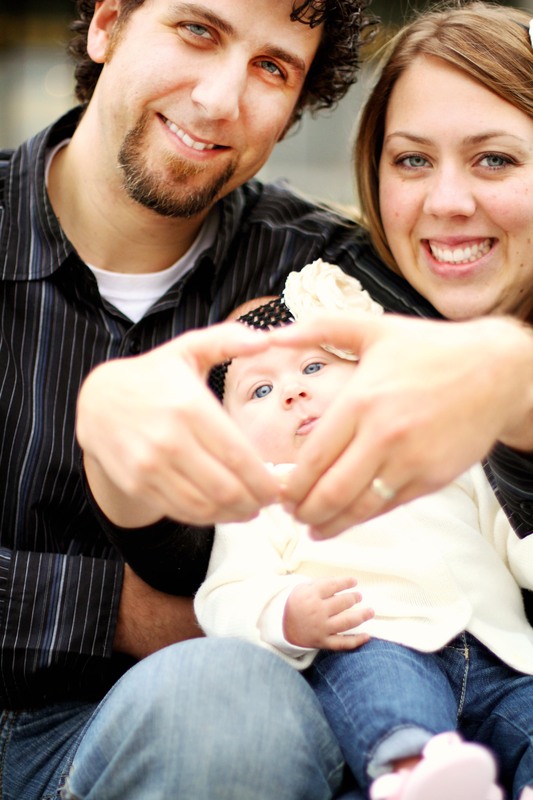 On a personal note, please pray for Ellen’s sister Jamie and her husband Joe who is still in the hospital for more than a week now with complications after losing their baby that Jamie carried for more than 7 months. 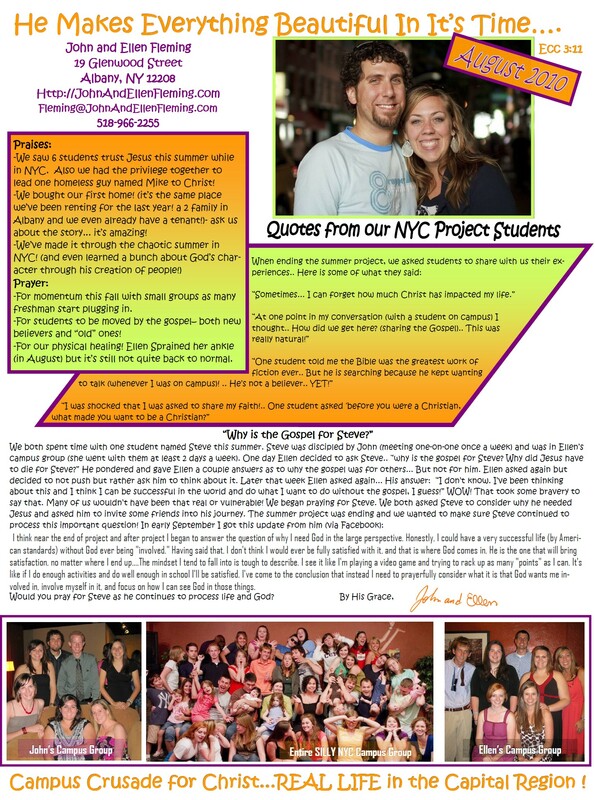 October 2009 Newsletter: Lots of Great stories! It is a privilege to do what we get the opportunity to do. This month we are excited to share with you some more great opportunities we had to see God work around us! 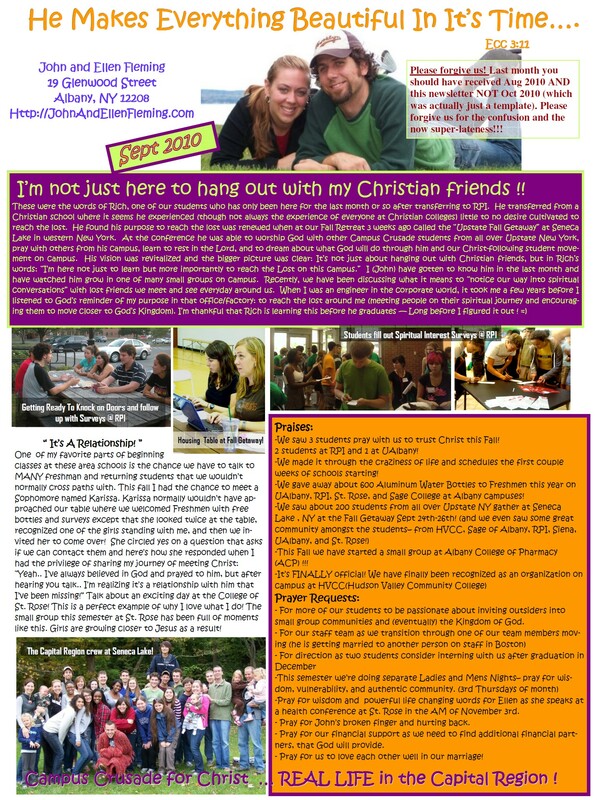 Attached you will see our latest newsletter that you can read by clicking on it. It includes the good news about a new student coming to Christ who is a close friend of Nora, a student who came to Christ about a year ago who you may have heard about from us in the past! We are rejoicing! We hope you enjoy our latest newsletter about our new sister in Christ at The College of St. Rose!! God has born this kind of spiritual fruit through our partnership with you!! After two exciting months on the field, we have finished our time on the campuses for the Spring Semester, but we have an exciting summer ahead!! This includes packing up our things to move into a new apartment and then we will be headed out to training for over a month as it is our summer assignment this year. We will come back and unpack not only our bags but also our many boxes! We are moving about 20 minutes away into the city of Albany from our current apartment in suburban Voorheesville. We are looking forward to being closer not only to the college campuses (1 mile to the College of St. Rose, a few miles to University at Albany and many others) but also to being more available to college students who want to get off campus into a welcoming home. Ellen (more so than I) has a hospitality gift with which we will be able to welcome students and others more easily in the city. We look forward to sharing more stories like this one that features St. Rose and our friends Natalie and Kathy.